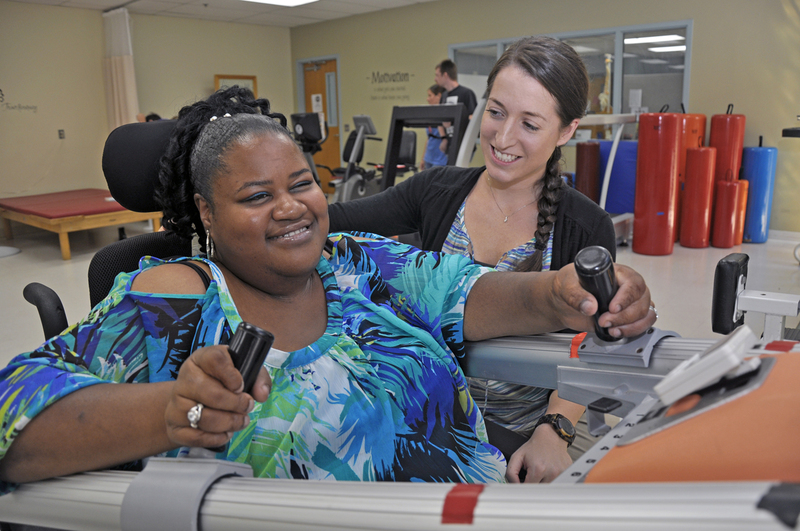 CP Rochester’s robust Clinical and Therapeutic Services Department provides services for a wide variety of diagnoses and rehabilitation needs for adults with disabilities (such as cerebral palsy, traumatic and acquired brain injuries, multiple sclerosis, muscular dystrophy, and others). In addition, services are available for those needing short-term rehabilitation related to an injury or surgery. The modern facility at the Winton Road Campus is fully-accessible, open and bright, and is specifically designed to meet the unique needs of the individuals in our care. The therapists and staff within Clinical and Therapeutic Services are highly-trained, experienced, and follow an interdisciplinary approach to care; they also coordinate services in conjunction with physicians, other involved providers, and equipment vendors. In addition to the large therapy space and up-to-date equipment, CP Rochester offers an indoor warm water pool which is an ideal therapeutic medium for many physical diagnoses. Thank you for your interest in CP Rochester's outpatient clinical services, which includes occupational therapy, physical therapy, speech therapy, psychology, psychiatry and dental services. With the variety of health insurance plans, including newer high deductible and co-pay insurance plans, many individuals and families have questions about their medical expenses. Each Health Plan carrier may offer several different plans, and CP Rochester may not accept all of these plans. Please contact your carrier to learn if your particular plan is accepted by CP Rochester and whether or not the services you require are covered under your plan. You can obtain an estimate of cost for planned clinical services through CP Rochester, upon request, by contacting Adrienne Donn, Clinic Office Supervisor, at 585-334-6000. A price estimate will be based on the information received about anticipated services. During the course of treatment, the actual services could change, where the provider finds it necessary to perform additional or fewer procedures, which may impact the cost of the service. Please allow 1-2 business days for us to provide you with the information after receiving your call.